Using an ironing board at the wrong level can be a strain on your back, so iron your own way with this board which has 8 height positions and an adjustable iron rest. 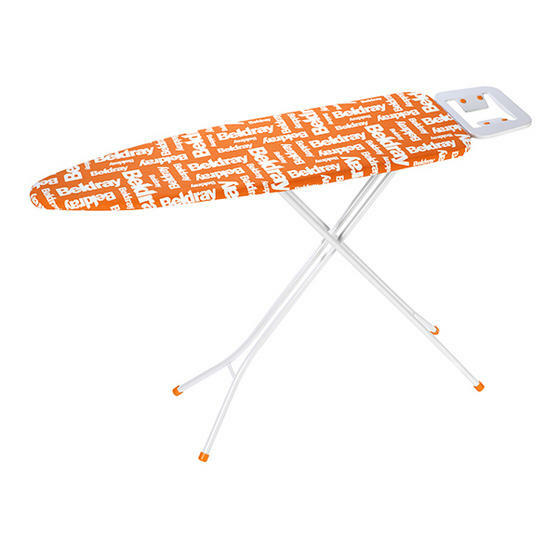 It features non slip plastic feet for safety, as well as a lovely soft cover made from 100% cotton with a bold orange and white Beldray print. With this superb ironing board, you can find the most comfortable way to iron for the best experience from start to finish. When I put up my sparkling new Beldray ironing board, it was a revelation. In a lovely fresh orange it is uplifting to behold, it was tall enough for me to use without stooping, and twice as wide as my old one. I was so much in love with the proportions of my new ironing board that I ironed everything in sight. Even my jeans, which I haven?t pressed since I used to have only one pair as a teenager, and had to iron them dry if I wanted to wear them out. The matching orange feet are the finishing touch to a new board, perfect for springtime. And apart from the board?s pleasing girth and height (adjustable to suit most people), I really liked the shelf for folded clothes under the board, which does not get in the way of your legs, as you might suspect. Thnaks to my new Beldray ironing board I now actively want to iron, at least for now!